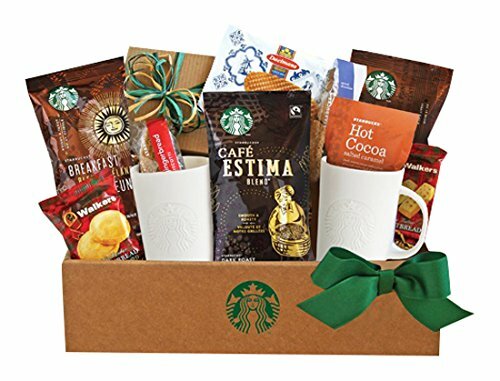 You can't go wrong with a classic gift of delicious Starbucks coffee and Starbucks cocoa. This Starbucks coffee gift holds two mugs so you can have a mug of coffee and a mug of cocoa at the same time. This delicious gift also includes walker's shortbread medallions and shortbread fingers, gingerbread biscotti and caramel wafer. Give someone the best of both worlds this holiday season with this Starbucks coffee and cocoa gift.